House of Representatives? Have the seven Maori Seats become a dangerous anomaly in New Zealand's system of representative democracy? 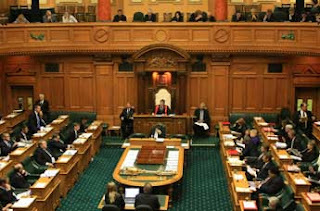 THE LAW REQUIRES that New Zealand’s House of Representatives contain 120 seats. Thanks to the peculiarities of our electoral system it may (as it does at present) contain more than that number – but it must not contain less. Of those 120 seats, seven are currently reserved for Maori. Only those citizens who enrol on the Maori Roll – an electoral register separate and distinct from the General Roll – may vote for candidates nominated for election in "Maori Seats". These seven Maori Seats are without doubt a constitutional anomaly. Their existence owing a great deal more to political expediency than they do to democratic theory. Separate Maori representation came into existence in 1867. The settler parliament saw the creation of four "native" seats as the most expedient way of getting around the fact that most Maori couldn’t meet the property qualifications of the franchise. Colonial politicians point-blank refused to recognise the "beastly communism" of collective Maori property relations. But, with war still raging between Maori and Pakeha, the settler parliament thought it advisable to include "loyal" Maori (if only symbolically and temporarily) in the legislative process. Had our colonial forebears been at all concerned to accord Maori political representation commensurate with their numbers, then four seats were nowhere near enough. No one knows precisely how many Maori adult males there were in 1871, but the number is unlikely to have been less than 10 percent of the total adult male population. At the very least, there should have been eight – not four – "Maori Seats" in the 78-seat chamber. By the turn of the 19th Century, however, the Maori population had crashed. The cumulative effects of war, disease and cultural demoralisation had brought the indigenous people close to extinction. In 1900 the four seats provided for in the 1867 legislation almost certainly over-represented the Maori electorate. But the Settler State, having extinguished indigenous military resistance, and confident that the Maori "race" was about to disappear altogether, was willing to let the anomaly of the Maori Seats linger-on a little longer. Besides, having Maori parliamentarians could be very helpful – as when the Northern Maori MP, Hone Heke, defused the so-called "Dog-Tax War" in 1898. Having Maori MPs supporting your political party could also be very helpful in a close electoral contest. Labour was by no means the first party to build a relationship with the Maori electorates – and certainly not the last. And so this constitutional anomaly persisted. Not even the 1985-86 Royal Commission on the Electoral System – which argued that the introduction of proportional representation would make the four Maori Seats both superfluous and unnecessary – could prise them out of New Zealand’s political culture. It is not always wise, however, to allow anomalies to persist in the body politic. Like free radicals in the human body, constitutional anomalies have the potential to trigger potentially dangerous mutations. Rejecting the Royal Commission’s recommendations on the Maori Seats, for example, meant that instead of the 120 seats of the House of Representatives being divided equally into 60 Electorate and 60 List Seats, the split was 65:55. By 2008 the steady increase in the number of Maori seats had exacerbated the numerical imbalance of Electorate over List Seats to 70:50. Ever-so-slowly our MMP electoral system is being transformed into the Supplementary Member system decisively rejected by the voters in 1992. The fact that we have an "overhang" of two seats in the current House of Representatives is due to the Maori Party winning more seats than its share of the Party Vote warranted. And, a quick analysis of the voting statistics of the 2008 General Election shows that while it took 35,446 votes to elect a General MP, only 20,476 votes were needed to elect a Maori MP. The Maori Party co-leader, Dr Pita Sharples, argues strongly that democracy is not simply a matter of "one man, one vote" – i.e. all votes being of equal value – but that it’s also about protecting the minority from the majority. That’s true, and if the Maori Seats can claim any justification – then surely this is it. But, isn’t it equally true that no minority has the right to protect itself at the expense of the majority? In political theory, a minority whose rights and privileges are accorded greater political weight than the majority’s has a name, it’s called – an Aristocracy. This essay was originally published in The Timaru Herald, The Taranaki Daily News, The Otago Daily Times and The Greymouth Evening Star of Friday, 9 April 2010. Maori clearly are not an "aristocracy" in this country - unless you subscribe to Don Brash's Orewa rhetoric that Maori have somehow become a privileged elite (and even Brash has now apologies for that load of racist rubbish). So I wonder what your point is Chris? Clearly, David, the vast majority of the Maori population could lay no claim to the title of "aristocrat". In socio-economic terms it's a ludicrous suggestion. With the Maori Party in alliance with the Right, and increasingly prone to advancing the interests not of the poorest Maori but the wealthiest, the situation may soon arise in which the Maori Party will be able to thwart the clearly expressed will of the broader electoral majority - after the fashion of the un-reformed British House of Lords in the early years of the 20th Century. This would not be a situation conducive to the maintenance of racial harmony. Less tendentiously, 81% turnout vs 62% turnout, plus the effects of a younger (meaning less eligible to vote) population. Because that's all this is. A Maori seat is, give or take rounding error, the same size as a general district. So your implication that this is some sort of gerrymander to privilege Maori is simply false. As for overhangs, the real problem here isn't Maori electorates, but electorates themselves. If you want to remove them, you need to move to a list-only, pure PR system. Mr Trotter, in what way do you perceive welfare dependency to be 'in the interests of the poorest Maori?" I/S is right, Chris - we have a system that sees everyone represented in Parliament, even those who are under 18. Indeed, you can use the numbers in different ways: those of Maori ethnicity make up 15% of the population, those of Maori descent make up 18% of the population, yet Maori only get 12% of the votes. Is that fair? I wonder if you would be so keen to see the Maori seats abolished Chris, if Labour held them all? This post seems like a beatup to me - an interesting beatup, but a beatup none the less. An aside - the electoral system vote was 18 years ago - we are entitled to change our views based on our experience since. I voted for MMP then, but am open to SM now (as the experience of list MPs who see themselves as above the voters must be curbed). I would far rather have SM with STV in electorates, with say a fixed ratio of 5% of party vote earning 1 MP (ie 20 list MPs out of roughly 120), and have all electorate MPs recallable, so we can bring the beggars to account more regularly than every 3rd year! (if needed). The accountability is what is important - party & conscience votes will cease (as they should) when MPs must obey their electorates! The Maori seats will be scrapped when the public (including Maori) feel that we have an electoral system that guarantees significant minorities a voice in Parliament, and accountability on those MPs. So far we have the first (though not firmly if the Maori seats are taken out), and we definitely do not have the latter. Not so much a beat-up, Anonymous, as a provocation - an attempt to stimulate debate on an issue which is only likely to grow in importance as the consequences of the Maori Party's embrace of Far Right policies becomes increasingly apparent to the wider NZ electorate. I am greatful to Idiot Savant for his comments regarding the discrepancy between the number of votes required to elect a General MP as opposed to a Maori MP (but disappointed at his extravagant and insulting comments about this posting on his own site). The analysis he offers is interesting - although not, to my mind, entirely persuasive. My observation regarding the number of votes required to elect General and Maori MPs should be read in conjunction with the rest of the posting, which homes in on the anomalous character of the Maori seats. That voters on a special roll (which by no means includes every person identifying themselves as Maori) after casting fewer votes than their compatriots on the General Roll, can nevertheless exercise such a profound influence over the course of national events is - whether people who share Idiot Savant's views like it or not - deeply troubling to a great many New Zealanders. That their concerns will, by the very nature of Maori Seats, be focused on racial distinctions operating in an electoral context raises all manner of frightening political possibilities. Asking people to think about these possibilities is no more "race-baiting" than identifying possible fire risks is an incitement to commit arson. My response to your own suggestions regarding SM, STV and the Right of Recall is not, I'm afraid, enthusiastic. SM is merely FPP in drag. STV was deliberately designed by the Irish nationalists of the 1920s to hinder the growth of political parties - institutions which I consider to be indispensible to the preservation of political rationality. And the Right of Recall is merely an invitation to admit to one's political system the very worst excesses of demogogic political manipulation and the breakdown of effective and reliable government. Operating together they would, I believe, work with deadly efficency to undermine public faith in democracy itself - the very opposite (I hope) of the outcome you were seeking. I think Idiot Savant has debunked the idea that Maori are getting 'more MP for their vote'. I have never heard any Kiwi express concern that the Maori seat MPs "nevertheless exercise such a profound influence over the course of national events", but I agree many people (myself included, to a certain extent) have concerns about "the very nature of Maori Seats, be[ing] focused on racial distinctions operating in an electoral context". This is an unresolved question - should indigenous peoples have greater rights (whether from a specific Treaty or not) than later migrants in their land? Ironically, the anomaly of the Maori seats keeps raising this point for debate, as the seats inspire Maori to aspire to separate political seats on councils, etc. To discuss this is not racebaiting, though, and I never claimed you were. I am very interested in your reasoning as to why making MPs more accountable (through recall votes, STV electorate elections, and SM giving limited influence to nationwide party votes) necessarily brings "the breakdown of effective and reliable government"? Demagoguery is always a concern under any system of course - MMP neither caused nor prevented Winston, Anderton, Alamein Kopu (ho ho), the tight 5, etc. But my suggestions would shift NZ's parliament towards individual MPs usually belonging to and voting along party lines, except where their electorate has specifically indicated otherwise, where the voting would be akin to a conscience vote - the 'electorate's conscience', that is. The MP functioning simply as the vessel to express the collective contents of the minds of their local populace (rather than the MP's party, which has normally has fewer members than 1 electorate). This will reshape NZ politics to a certan extent - MPs would have to be more responsive to their electorates; regular polls of local views on topical issues, MP's local meetings to hear and debate public opinion, and the MP then arguing his or her electorate's views to the other MPs in the House (who can take back such alternatives for feedback from their electorates). This may make NZ government less reliable a servant of capitlaism, but more effective in representing NZ worker's views.